A bay scallop is the smaller, sweeter cousin of a sea scallop. And, because they're less plentiful, they're more expensive. If you can avail yourself of these 1/2-inch-diameter bivalves that have a count of 100 per pound, consider yourself lucky. Fresh are best but frozen will do and since these little beauties are so succulent, simple preparations are the best. Forget about deep-frying them. A quick pan-fry is the way to go. Because of their smaller size, bay scallops cook quickly. Make sure the rest of your meal is prepared and the scallops are the last item you cook. This easy recipe calls for only a few simple ingredients and, of course, oil for frying. Add 2 tablespoons oil to a large cast-iron skillet and place it over medium-high heat while you prepare the scallops. If your scallops still have the tough side muscles attached, pinch them off. Rinse and pat them dry. In a medium bowl or zip-top plastic bag, combine breadcrumbs, garlic salt and optional cayenne pepper. In batches, dredge dried scallops in breadcrumb mixture until they are coated on all sides. Remove scallops, shaking off excess breadcrumbs, and place on a parchment paper-lined sheet pan. When oil is hot (a drop of flour will sizzle in the oil), place one batch of scallops in a single layer in the hot skillet, making sure not to crowd them; otherwise they will steam instead of sear. Pan fry 1 minute, turn and fry until lightly browned on all sides, another 1 to 2 minutes. Remove scallops from pan with tongs or a slotted spoon and drain on paper towels. Sprinkle with sea salt. Keep warm by covering lightly with foil. Repeat with remaining scallops, adding more oil if necessary. 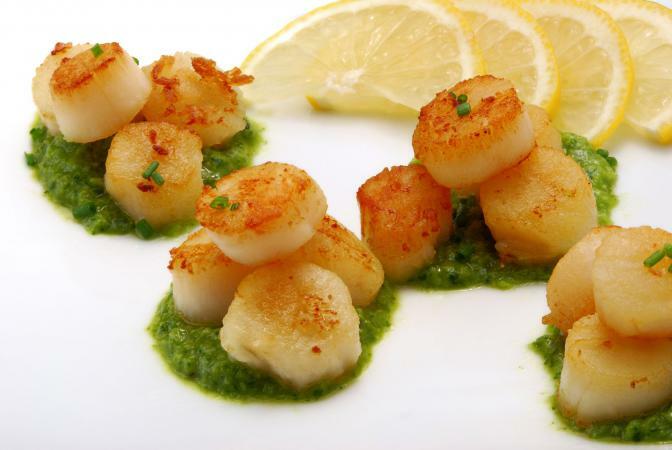 To serve, place small pools of pesto sauce on each plate topped with three bay scallops and a sprinkle of chopped chives. Serve with sliced lemons. Some good accompaniments for this dish would be buttered angel hair pasta or rice pilaf, crusty bread, and a garden salad. You can take your simple scallops and make them even more delicious with a couple gourmet tweaks. An easy gourmet spin on bay scallops is to pan-fry them as in the recipe above and serve in an Alfredo sauce over fettuccine. This pairs well with steamed asparagus or zucchini. Sauté 1 pound of cleaned and dried scallops in 1 1/2 tablespoons olive oil and 3 tablespoons butter until brown on both sides. Add 3 cloves of slivered garlic, 2 tablespoons lemon juice, 1/4 cup dry white wine and 2 tablespoons tiny capers. Season with salt and pepper, chopped parsley, and lemon zest. Serve with crusty bread for dipping in the garlic-butter sauce. Bay Scallops Nowhere? Don't Despair! If you can't find bay scallops where you live and you want to expand your scallop recipe collection, try using their bigger cousins to make sea scallops in bacon. Conversely, if sea scallops are scarce in your area, try using a sea scallop recipe with bay scallops. The biggest thing to remember is not to overcook scallops.